Aeroméxico Flight 2431 operated by an Aeroméxico Connect Embraer ERJ-190 impacted airport terrain shortly after commencing takeoff from runway 03 at Guadalupe Victoria International Airport (MMDO), Durango, and a post-impact fire ensued. All 103 occupants survived but 14 suffered serious injuries. The aircraft arrived at Durango from Mexico City as flight 2430 at 14:11 hours local time, 23 minutes ahead of schedule. As the ERJ-190 was prepared for the return flight there was a broken layer of cumulonimbus clouds at 2500 feet. Airport weather information shows that a thunderstorm had developed by 15:18 hours local time and the temperature had dropped from 28°C to 20°C over the previous hour. In the flight crew on board flight AM2431 consisted of a captain, co-pilot and an observer. The observer was a licensed commercial pilot with type rating for Beech King Air planes. He was in the process of obtaining a type rating for Embraer jets and had accumulated 64 hours of simulator time. The captain allowed the obverver to take the right hand seat and the co-pilot occupied the jump seat. He also allowed the observer to act as Pilot Flying. The aircraft commenced the takeoff roll on runway 03 at 15:22 hours local time (planned departure time was 15:09 hours). During the takeoff roll there were notable variations in airspeed and wind direction. At 15:22:42 hours, the aircraft was accelerating through an airspeed of 146 knots. Wind at that time was 47 degrees (from the right-hand side) at 33 knots. Eight seconds later the aircraft had rotated and was climbing through 8 feet radio altitude at an airspeed of 145 knots. By that time the wind had shifted to a crosswind: 103 degrees at 11 knots. The aircraft reached a highest altitude of about 30 feet. At 15:22:56 hours, the aircraft had descended to 19 feet and was caught in a 22-knot tailwind of 30 degrees. The aircraft then hit the ground to the left of the runway, left wing first. Both engines broke away during the subsequent ground slide. The aircraft came to rest about 380 meters past the runway threshold and 320 meters past the paved end of the runway, slightly to the left of the extended centreline. The length of runway 03 is 2900 m (9514 ft). Causa probable: "Impacto contra la pista originado por la perdida de control de la aeronave en la fase final de la carrera de despegue por windshear a baja altura al producirse una pérdida de velocidad y sustentación"
a) Disminución de la conciencia situacional de la tripulación del vuelo SLI2431 al estar realizando el comandante tareas de instrucclón no autorizadas sin estar calificado para proporcionar instrucción de vuelo y asignar funciones de copiloto y piloto volando de la aeronave a un piloto no certificado ni autorizado. b) Omisión en detectar las variaciones de indicadon que mostró el indicador de airspeed en el PFD durante la carrera de despegue. c) Falta de apego a los procedimientos de cabina estéril y procedimientos operacionales (TVC; Cambios de pista y/o sus condiciones al despegue posterior al cierre de puertas; Take off in adverse conditions windshear) establecidos en el Manual de Operaciones de Vuelo, en el Manual de Despacho y en los Standard Operating Procedures de Aerolitoral, S. A. de C. V.
a) Falta de apego al procedimiento 7.18 "Cizalleo a baja altura" publicado en el Manual de Gestión de Tránsito Aéreo de México, Ed.2018. 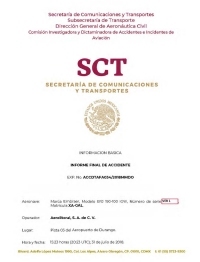 b) Falta de apego a lo estipulado en el punto 7.4.1.2 Información de aeródromo y meteorología, inciso 7.4.1.2.1 y 7.4.1.2.2 del Manual de Gestión de Transito Aéreo de México, Ed. 2018, de proporcionar información de variaciones importantes en la dirección y velocidad del viento, valor de la visibilidad existente al momento del despegue y condiciones meteorológicas significativas. c) Falta de personal supervisor en TWR DGO. Distance from Durango-Guadalupe Victoria Airport to Mexico City-Benito Juárez International Airport as the crow flies is 763 km (477 miles).